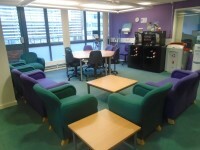 Services / facilities within the building include Human Resources, e-learning lab, Learning Lounge, HR Training & Development, APDU and Academic Quality. 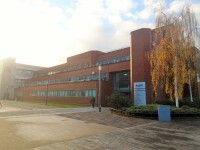 Related link Main Car Park. 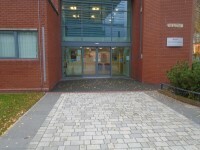 This venue is situated in Leicester. The nearest mainline station is Leicester. This venue does not have its own car park; the nearest car park is Gateway House. There are 8 designated parking bays within the car park. 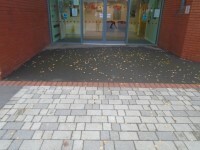 The dimensions of the designated parking bays are 3.6m x 5.4m (11ft 9in x 17ft 8in). The nearest designated bay is 32m (35yd) from the main entrance. The furthest designated bay is 45m (49yd) from the main entrance. Parking is free for DMU Disabled/Temporary Disabled Parking Permit holders and pre-booked visitors. Parking spaces for Blue Badge holders cannot be booked in advance unless an external visitor (visitor spaces in Gateway House). 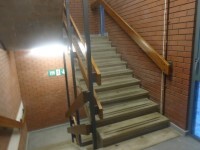 The stairs are located to your right on entrance. 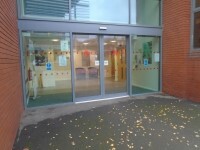 There are push pad automatic doors to exit and enter the stairwell. 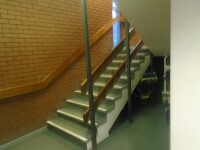 There is an alternate set of stairs to the far left of the building. 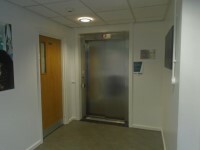 The dimensions of the lift are 135cm x 145cm (4ft 5in x 4ft 9in). 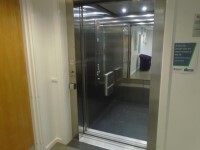 There is a 60cm high flip down seat inside the lift. 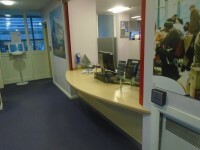 The desk/counter is 4m (4yd 1ft) from the lift. 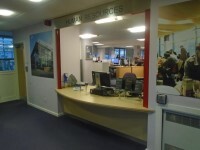 The reception desk is located on the first floor. 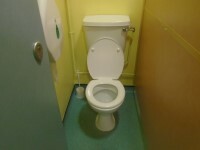 This accessible toilet is approximately 8m (8yd 2ft) from the lift. 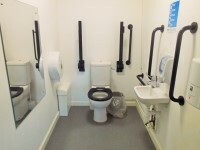 This accessible toilet is located on the second floor, to the right as you exit the lift. 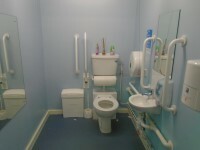 The dimensions of the accessible toilet are 138cm x 230cm (4ft 6in x 7ft 7in). 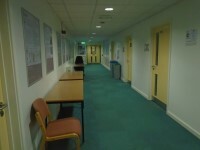 There are male and female standard toilets facilities on the first floor and the second floor. 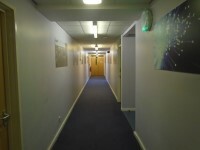 The female and male toilet facilities that were surveyed are located on the first floor, straight ahead when exiting the lift. 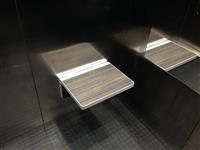 The female and male toilets are approximately 6m (6yd 1ft) from the lift. 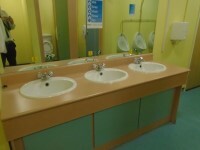 There are also standard toilets on level 2. 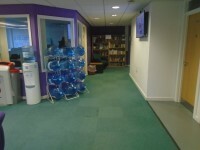 Disability awareness training is available for staff.